• Chana dal - 1 tablespoon. • Tamarind pieces - 3-4 pieces. • Tomatoes - 4 numbers. • Urad dal - 1/2 tea spoon. • Asafoetida - 1 pinch. Heat 1 tablespoon oil in a pan add coriander seeds, red chili, chana dal, fenugreek seeds, saute it for 2 minutes. Then add peanuts, sesame seeds and garlic, tamarind pieces, tomato pieces, salt to taste saute it and reduce the flame, put the lid on and let it cook for till tomatoes are nicely soft. Let it cool down and put all the ingredient into the blender and make a coarse paste. For the tempering: Heat 1 tablespoon oil in a pan add mustard seeds when mustard seeds splutter add cumin seeds, chana dal, red chilies, urad dal, when dal is slightly colored add pinch asafoetida, curry leaves, switch off the flame. Pour this tempering on the top of the chutney and mix it. Serve this chutney with Rice, roti or dosa. Lip snacking spicy chutney made out of tomatoes and red chilies and best served with idly or dosa. Lip snacking spicy chutney made out of tomatoes and red chillies and best served with idly or dosa. 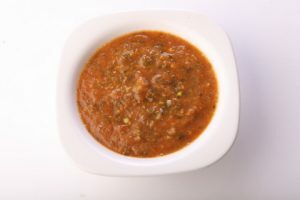 Fatta fat Tomato Spicy chutney is a lip smacking spicy dish made with country tomatoes and red chillies blended together... Read More.. Lip snacking spicy chutney made out of tomatoes and red chillies and best served with idly or dosa. Fatta fat Tomato Spicy chutney is a lip smacking spicy dish made with country tomatoes and red chillies blended together with garlic, channa dal, fenugreek seeds, cumin seeds, coriander seeds, sesame seeds, groundnuts and few tamarind pieces. The taste of this spicy chutney is exceptionally exotic with loads of flavors that gives a super punch to the taste buds. Firm, red, juicy tomatoes are best for preparing this tomato spicy chutney. The country tomatoes give an awesome tangy taste and tamarind balances well with the other spicy flavors. Sesame seeds and groundnuts give a nutty and crunchy effect to the chutney while eating. It also gives a dense texture to the chutney. The chutney has a great balance of spicy, sweet, and sour and goes well with pretty much anything - bread, rice, crackers and cheese, rotis, you name it. Normally this dish taste amazingly exotic with hot rice and ghee. You can find a jar of tomato chutney in every home in southern India – extremely versatile and tasty, also can be used as a dipping sauce. Heat little oil in pan and add coriander seeds, red chillies, channa dal, fenugreek seeds and sauté for 2 minutes. Add peanuts, sesame seeds, garlic, tamarind pieces, tomato pieces and salt. Reduce the flame and sauté. Cover the pan with a lid and let the tomatoes cook until they become soft. Once the tomatoes get soft, switch off the flame and cool these ingredients. Put the ingredients into the blender jar and grind to coarse paste. For tempering: Heat oil in a pan, add ¼ mustard seeds and when they splutter, add cumin seeds, chana dal, red chillies, urad dal and slightly sauté until the dal is slightly colored. Add hing, curry leaves and switch off the flame. Tomato is a very essential ingredient in almost all cuisines. These lovely red cute glossy shiny vegetable adorns a variety of Indian curries and makes them highly flavorful. They also add a striking color to the dish. You can make varied recipes like tomato sauce, ketchup, tomato chutney, tomato juice, tomato puree or tomato rasam etc. Tomatoes are often used in our daily diet included in preparing dals, sambar and different varieties of tomato based curries. Tomatoes have a subtle sweetness that is complemented by a slightly bitter and acidic taste. Cooking tempers the acid and bitter qualities in tomatoes and brings out their warm, rich, sweetness. Tomatoes are by far the healthiest of the fruits and vegetables with the power to ward off some of the worst known diseases to man. They are loaded with all kinds of health benefits for the body. They are in fact, a highly versatile health product and due to their equally versatile preparation options, there’s really no reason to neglect the tomato as part of a healthy diet. Calcium rich sesame seeds adds in enhancing the taste and gives a nutty flavor while tomato has a tangy taste thus combined makes a luscious combination that makes this tomato spicy chutney irresistible to taste. Sesame seeds are used mostly in seed form in Indian cooking and are usually first roasted gently as it helps release their aroma and flavor into the dish. They are considered to possess 'heat giving' properties and thus are consumed more during cold, winter months when they are made into sesame chikki and ladoo (ball-shaped desserts) or added to curries. In Mughlai (rich, North Indian style of cooking) cooking, sesame is used in paste form to add thickness and richness to gravies. Sesame oil was the cooking oil of choice for many, before the use of peanut/ groundnut oil became common. Delicious, crunchy sesame seeds are widely considered to be healthful foods as they are high in energy but contain many health benefiting nutrients, minerals, antioxidants and vitamins that are essential for health. There are many ways of preparing the tomato chutney. Usually the tomato chutney is eaten few days after you are spice deprived and craving for something that would get your taste buds tingling again. This tomato spicy chutney is just irresistible and has an addictive aromatic flavor. Do enjoy preparing this fatta fat chutney. Trust me! This fatta fat tomato spicy chutney will surely be the highlight of your menu. You can also eat it with dosa, uttappam, pesarattu, rice, roti, jowari ka roti, bajre roti etc. Eatin tomatoes have enormous health benefits that includes, they are good for skin, prevent several types of cancer, help repair damage caused by smoking, provide essential antioxidants, good for heart, hair, kidneys, eyes and diabetics and many more. Tomatoes are an excellent source of vitamin C, vitamin A, and vitamin K. They are also a very good source of molybdenum, potassium, manganese, dietary fiber, chromium, and vitamin B1. In addition, tomatoes are a good source of vitamin B6, folate, copper, niacin, vitamin B2, magnesium, iron, pantothenic acid, phosphorus, vitamin E and protein. muche aap style sanjiv kapoor se bhi achcha lagta hai? Where is the tamarind in this, as you said in beginning? ? You can also make this with green chillies and when you eat it with hot rice with little ghee.. it's YUMMY..? can we replace peanuts in this recipe as my hubby is allergic to peanuts?? Can u tell me the measure for 4 to 5 tomatoes? I love when he does ... mmaaammmmhhgghh?